Why do some people develop neurodegenerative diseases while others do not? Do hormones play a role in social behavior? How can new treatments slow or stop the progression of infectious and noninfectious diseases? Science begins with questions, and researchers at the Yerkes National Primate Research Center are taking the first steps in the comprehensive yet complicated process of finding answers. 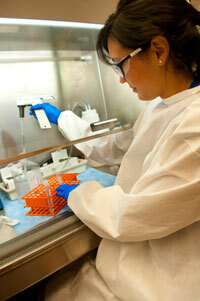 Our work is in understanding the human body and behavior and in beginning the translational research process. Research started at Yerkes provides a vital connection to further scientific discovery that will improve the health of our nation and the world.